More support from Bellevue Idaho. To watch the video click here. Thanks for sharing your work is awasome..Get the latest mens haircut style 2017 with new styles and trends.. Save the new collection of hairstyles. Cahmpion trophy live streaming champion trophy live score and bally ball commentary. Ryan Roche, 36, is continually inspired by her dreamy, vibrant childhood beneath the wild blue and pink Idaho skies. Ryan creates a clean minimalist modern romance for women. Ryan is known for her harmonious relationship to color. Subtle, feminine shades and luxurious textures are inherent to each collection and tell the poetic story of the distinct sensibility in which it is rooted. Ryan is committed to supporting responsible manufacturing via sustainable, low-impact production. She has worked with a women’s cooperative in Nepal for the last decade and also supports American manufacturing. Ryan Roche was founded in 2011 after seven years of designing her children’s brand Mor Mor Rita. 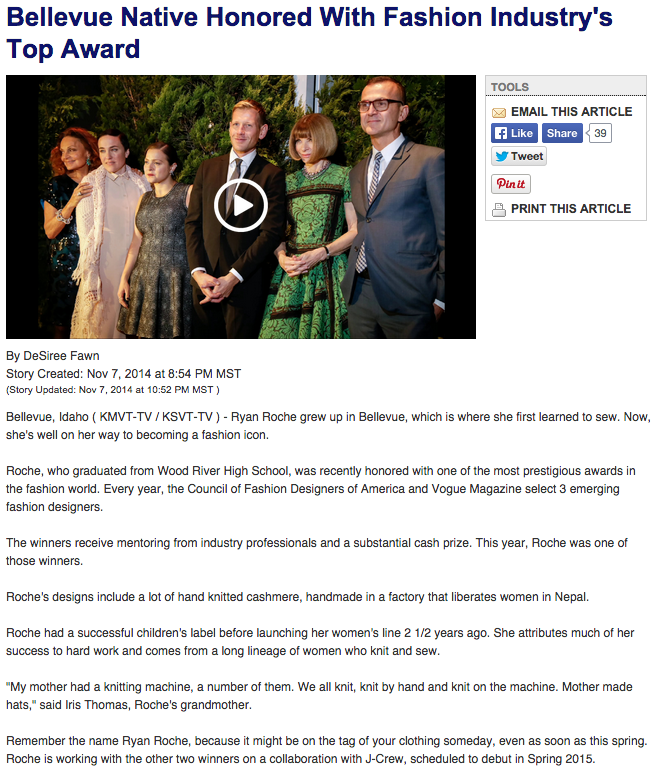 Ryan Roche has been featured in American Vogue, British Vogue, The New York Times Sunday Styles and Thursday Styles, T Magazine, American Marie Clare, American Harpers Bazaar, LA Times and most recently on Style.com as “The next big thing” Ryan was selected as a runner up in the prestigious CFDA / Vogue Fashion Fund for 2014. Ryan Roche, 36, lives and works in a 17th century stone house in upstate New York with her husband, three children, their Poodle and twin Rhodesian Ridgebacks. ©2011 Ryan Roche. Simple theme. Powered by Blogger.